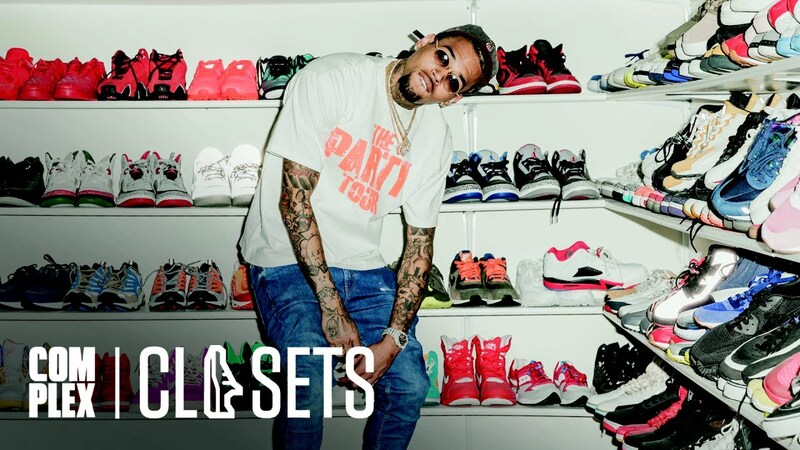 Breezy’s collection takes up multiple rooms and includes some of the rarest kicks out there. Brown gave Complex a tour of his collection as part of their Complex Closets series. The collection features exclusive new shoes like Yeezy Boost 350 V2s and Nike X Supreme Air More Uptempos along with classics like Vans and Nike Cortez. He also had some sneakers that are true one-offs, including a pair of Air Force 1s with one of his Vibe covers on them that a fan made and sent to him and a pair of Jordans signed by legendary director Spike Lee. That was all in the first closet, big by most people’s standards but nothing to Brown. His second closet is even wilder. “I’m like a clothes hoarder I guess,” he said. But unlike some sneaker heads Breezy isn’t about keeping them box fresh, he actually wears them. Complex’s Joe La Puma asks the obvious question, how do you wear so many pairs? But the shoes don’t stay in the house. He says that on his most recent tour, the Party Tour he took 1000 pairs on the road with him. “I think clothes and fashion is an extension of my creativity," he explains. But with so many sneakers from so many brands and collabs, is there anything Breezy wouldn’t wear? DJ Khaled's colleciton was wild, but we think Chris Brown takes the crown.